2018 UPDATES - see below! 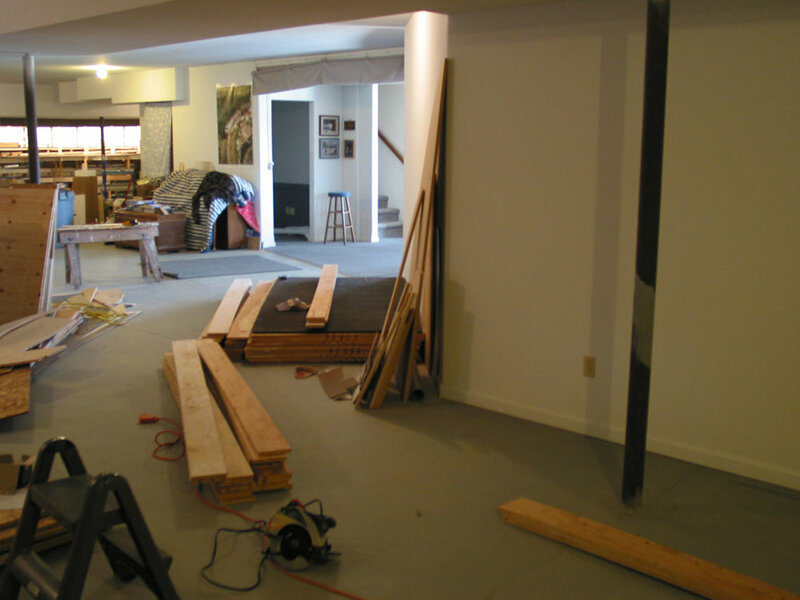 Phase 6 began in March, 2012, at the other end of the basement. The photo is looking back to the phase 2, Millport end of the basement, some 80' away. The mailnline here reaches 61", so a raised floor is necessary to keep operations at a reasonable height. 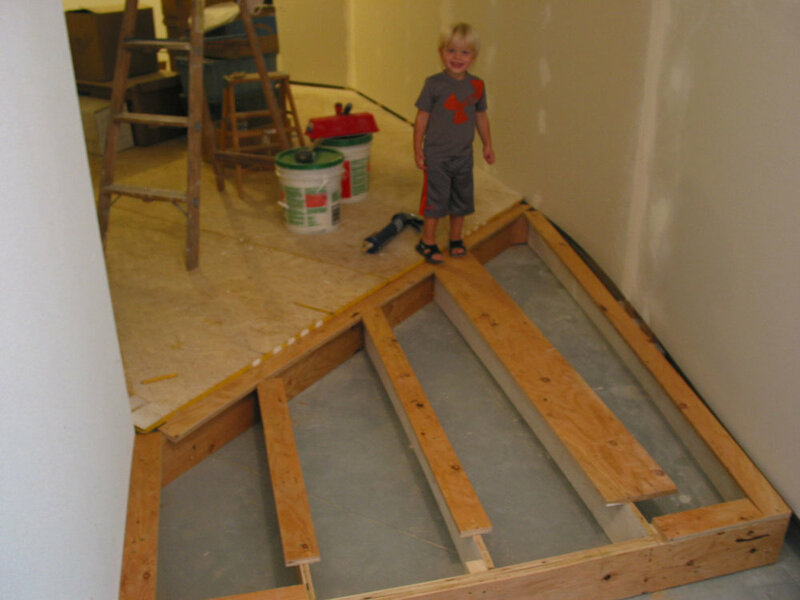 A 6" high framework of ripped plywood was anchored to the walls and glued to the floor. The framework grid was topped with plywood strips, glued and screwed, making a Tee. This would provide a better anchor for attaching the flooring. The horizontal "doorway" is actually the step-down area for future nod-under entrance into the Kayford Valley. Regular tongue and groove 1" flooring was then glued and screwed to the framework. The elevated floor is now complete, the future home of my new "rain room", a demanded repeat from A&O 1.0. Very solid. 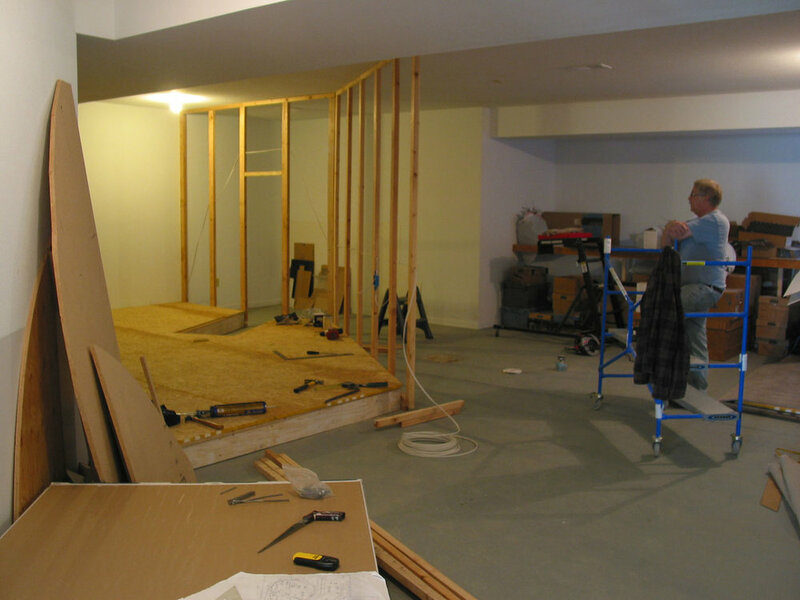 Bill Wood's former days as a house framer came in handy as we began to add the interior walls on 2.0. The open space of the basement was about to disappear. Since these new sud walls represent the winding valleys of West Virginia, they were definitely not straight. How to find their locations in the open space? Lots of plan checks and the use of splines. Here a landscape cinderblock serves to temporarily hold the spline in place until a line can be drawn. Kingston uses the scale rule to check the plan and locate the walls while Craig surveys the chaos. The studs were attached to the ceiling and main floor's TJIs (floor joists). Thus the walls are "floating" as opposed to resting on the concrete. Note that the studs will be flat, vs. perpendicular to the drywall. 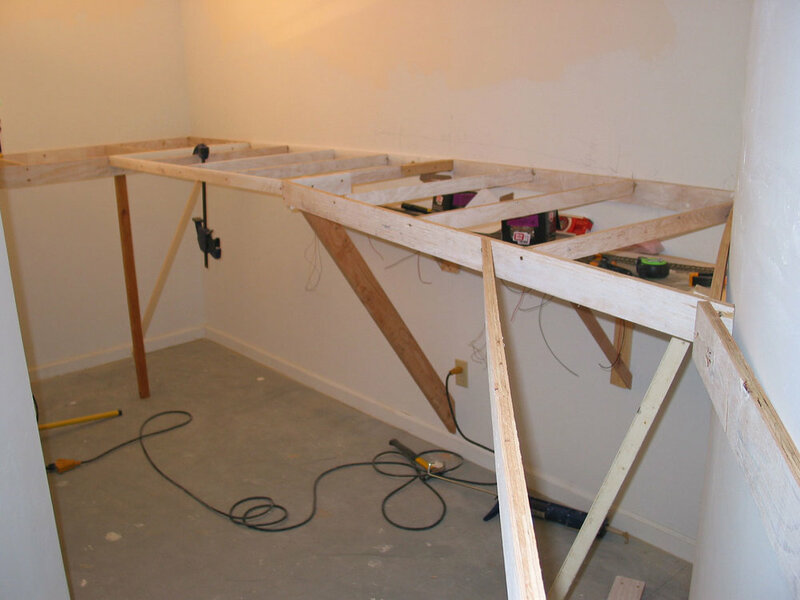 Stud "feet" glued and anchored to the floor and held in alignment with nail pins secure the walls in place. 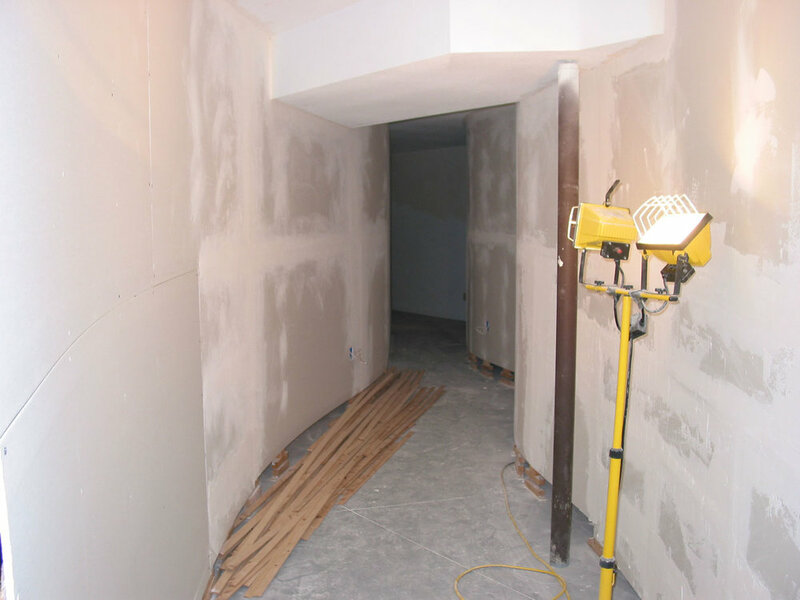 Having the studs flat provided a larger surface the sheetrock joints, and saved a few inches! 1/4" sheetrock worked well for the curving walls. 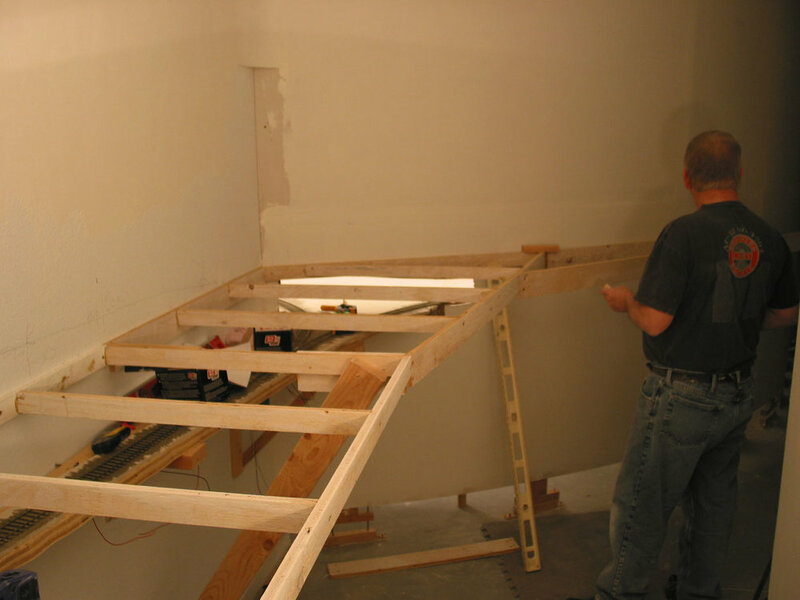 In the more tight bends we wet the drywall first and let it stand 15 minutes before bending and screwing to the studs. This is the future river gorge area, another feature from 1.0 to be replicated. The three aisles are now visible as the walls grow. On the left is aisle to the rain scene at Ridge. The center aisle is the Kayford Valley, and the right is Morrison to Ricksburg aisle. It's feeling very different down here! Note Romex feeding thru studs for outlet boxes on these interior walls. With the walls in place, I could add the additional elevated floor necessary for entrance into Ridge. Today I am assisted by grandson Jett. A look down the winding Kayford Valley. The Kayford Coal Branch will enter the valley thru the wall on the left. Shallow track scenes hug the mountain sides, serving numerous tipples. 150' later it arrives at Brooks, seen in the distance. Beginning framing of Brooks, the end of the Kayford Coal Branch. Track height here is 50". The tail of the wye at Ricksburg resides under Brooks (see phase 5) and with a 10" differential, is easily accessable. The framing completed and ready for track locates. This is the location of the operational King Coal Co. from 1.0 (see photos on 1.0 page). The building frame with its girder legs sits in future place. Time to build more wall. The river gorge wall is formed. Hanging the suds from the upper floor TJI's proves and bit of a challenge, especially when the walls are parallel to the TJI's. Bill Wood's carpentry experise is invaluable to this process. Rick Bacon and Bob Kjelland prepare the components for the stub-ended A&D staging. The A&D joins the A&o at Rock Bottom. The Antioc and Dover (A&D) is Rick's basement creation, and like Bob's NR&W, is a subsidiary of the A&O. Two tracks; two trains. Vince drew the assignmet of laying the switch for the A&D. The Gorge Operator Tunnel separates the gorge and Morrison from Rock Bottom and Sobol Springs, helping to create a separate sense of place. Thanks Bill. Looking back to the gorge as seen from Sobol Springs side. Looking thru the Gorge Operator Tunnel from Morrison side. Yet another operator tunnel; this one in the Kayford Branch aisle at the Hawkins loadout. A spline defines scene depth for finalizing track arrangement. The long operator tunnel on the Kayford seemed an operational negative.....until I thought of having viewing portholes in the fascia to catch glimpses of the trains progress. But this required detailing the tunnel lining. So I added 1/4" drywall, joint compound, weathering streaks, and multiple airbrushed washes of thin black. 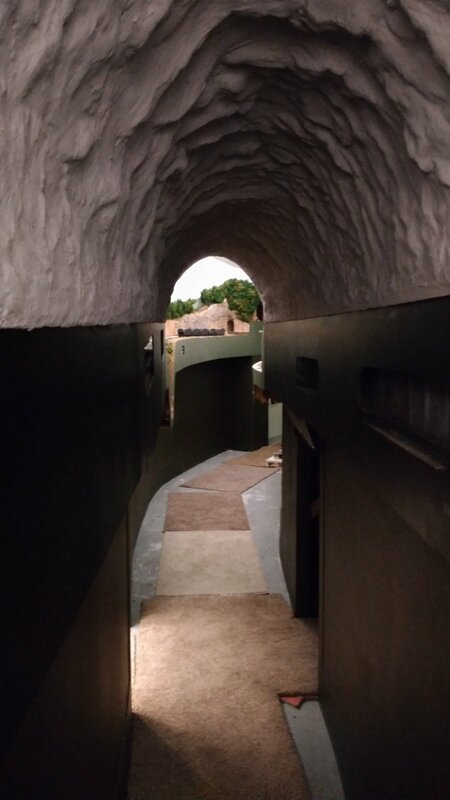 I left "mortar weep" lines in the joint compound as it was applied to the drywall so as to replicate imperfect form joints in the construction of the tunnel's interior. Weathering, ballast, etc. complete, the hardboard with two elongated portholes was added. The track height differential is very obvious in this photo- about halfway down the branch line. The base of the portholes follows the track elevation. Viewed from the other end, I have now added .040 black styrene, stapling it to the arched wood formers. Not the look I was hoping for as the light grazed off the styrene, drawing attention to itself. Uff. What to do...? Looking at pictures of actual tunnels revealed a lot of gunnite/shotcrete sprayed over the rock and dirt to create a hard shell. And, it was lumpy vs. smooth. So I crumpled up aluminum screen wire, flattened, and stapled it to the wood as well. Black concrete tint mixed into joint compound gave me my gray Shotcrete. A cheap paintbrush and I was underway. Note: this was a several day, several person job. And we're still friends! The first coat penetrated the screen wire and locked everything into place, but left plenty of screen exposed. The second coat of mud went on MUCH faster and an old 4" brush made short work of the tunnel. The end result, minus a little yet-to-do weathering streaks. A Shotcrete liner it is. No light bounce, an unusual train view, and a special operational experience for the crew. What was initially the negative tight spot in the overall track plan, is now an anticipated highlight of the run on the Kayford Branch (and you get to do it twice!). We begin a journey down the Kayford Branch by emerging from a tunnel at Apex. The Kayford main is the rear track and the portal will be about where the hopper sits. The Kayford is designed like a string of pearls....or linked sausages for a more savory metaphor.....with discreet scenes to increase the sense of isolation, and length. It is however, 150' in length, with the last town, Brooks, visible in the dim distance at the upper right; our destination. A closer look at Apex reveals that the out-of-service Jett Fuel tipple siding continues well past the visible siding. It penetrates the partition wall into the Linnwood side. It will extend behind town buildings, accessable for the Linnwood side. It's function is to hold empty hoppers for use as needed along the Branch. Though a small loader, Jett Fuel can disgorge empty hoppers like circus clowns from a tiny yellow car. Such chicanery is a staple of model railroading. 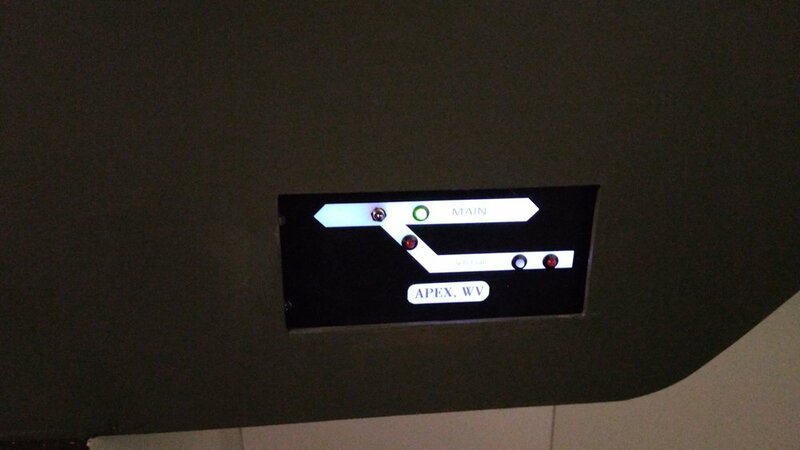 The small control panel at Apex reveals two LEDs that are activated as hoppers are pushed increasingly near the end of the track. 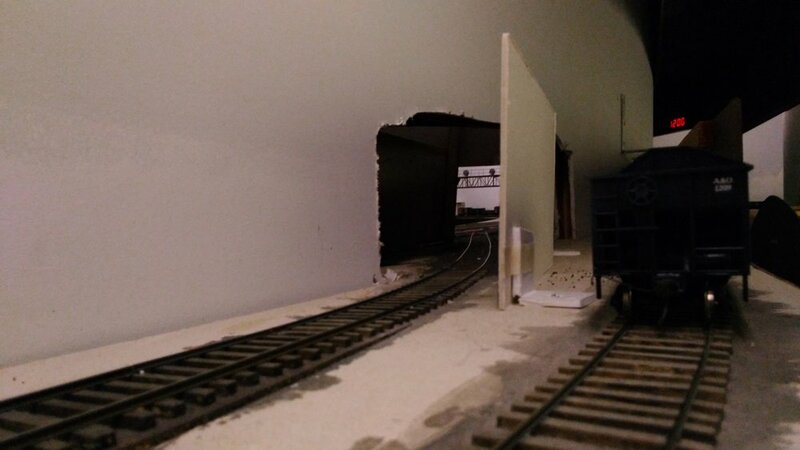 While this view thru the future tunnel will be blocked once scenery is in place, at the moment we can peep through into Linnwood Yard and see the signal bridge that gave us the "green" to begin our journey. Kayford is "dark territory" with traffic being managed by Track Warrant. Leaving Apex we dive into Rockcut Tunnel. Lining the full length of a tunnel where possible makes sound equipped locos an awesome experience. The sound builds and the anticipation rises. The only thing missing is the hot blast. Wood tunnel formers are cut on a band saw; thin strips of wood glued to the inside (sectioned for the top piece if on a curve); screen wire stapled on; drywall mud applied; hot glued in place. Be sure to ballast the track first. :( The portal is then attached and scenery blended. See next picture for the other end! Rockcut Tunnel is at the far end of this next vignette.A coal loader, D&K Dock, will come across the main to serve the hoppers sitting on the right.Structure and detail work to be done here, but the scene is well along. Because the main is descending a grade, the small panel includes a "Grade Brake" to hold cars while switching the dock is performed. The LED's are blue: One on the panel next to actuating toggle, and one near the track. With the ballast surround, it is invisible unless lit. A side-mounted Tortoise raises and lowers a wire between the rails to engage a wheel axle at the post indicator. Blue LED? Blue Flag- "Don't move this car." 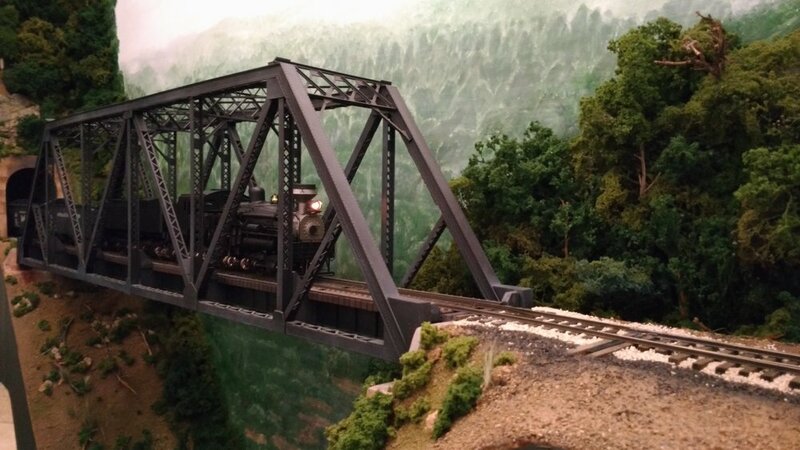 This scene concludes with an extra-detailed Atlas Thru-truss over a small river cut. Being near eye level at 59" off the floor, this is a visual treat. The next event is "Cathedral Tunnel", the uphill side of the long operator tunnel on the Kayford. Hopper cars can be seen passing thru the inside in the first of two elongated viewing portholes. Rounding into daylight we encounter King Coal Jct. The diverging track is the beginning of a looong passing siding with a midpoint crossover. The outer track forms a switch lead as well as pulpwood loading at the far end. The Main holds to the outside while the inner passing track doubles as the ladder for service to the eventual King Coal Co. As on A&O 1.0, this will be an operating loading site, filling hoppers with coal ("live loads" of fun). The King Coal panel of Kayford, WV. Kayford, WV features several merchandise spots to be worked by the daily Kayford Local. The telephone allows for crew communication with the Kayford Dispatcher on this Track Warrant branch. A view of the trackwork at Kayford reveals a double-slip switch as an integral part of the long mid-point crossover. It also leads into a small yard and industrial service. Space saving devices! The Kayford, WV panel. Toggles select routes, but pushbuttons handle the double-slip. Just push the button(s) for where you wish go and the proper switch points move. The knob at the lower left dims these LED back-lit panels for night-ops. The small Kayford yard, but long enough to allow entire trains to be held or pass as needed. King Coal Jct. on the left begins the passing track, which ends several feet past the last hopper in the distance. These tracks often hold cars waiting to move to/from the mines. Then it's back into the downhill side of the long operator tunnel, this time 7 Arches Tunnel. Watching headlights play on/off with the mortar weep, especially during night-ops is just plain cool. If you're keeping count, this is vignette #6 since we began. Exiting 7 Arches Tunnel we encounter another, medium sized tipple, the Hawkins Loadout. Like the D&K Dock across the aisle, it too requires a grade brake. D&K and Hawkins are switched daily by the Scarlet Shifter out of Ricksburg. The far side of the Hawkins Loadout will sit flat against the scene divider wall, suggesting the tracks continue beyond it, further down the valley. Some painting required. The main, meanwhile, has disappeared into another tunnel for the next vignette. Across the aisle is Rockcut Tunnel and Apex beyond that. The elevation change is now readily apparent. Welcome to Darwin, WV. A stretch of double track begins here along with 2 industrial spurs, a crossover, and a truck dump. A small foreground creek reinforces this as another WV "hollar." A look at the panel for controling this mess. A look at Brooks. Darwin is in the adjacent distance. Operator access to the Kayford aisle is a nod-under directly behind me. The work station at Brooks includes a phone to communicate with the town of Kayford and a magnet board to keep track of where trains have been given track warrant to be. The Brooks operator acts as the Kayford Dispatcher. Design also put the A&O dispatcher's Linnwood phone nearby so the two honchos can conspire together. Brooks, WV will feature two actual loading tipples to keep the Brooks operator from getting bored. Along with being the Kayford Branch Dispatcher, he currently also acts as nearby Linnwood Yardmster. Whew! 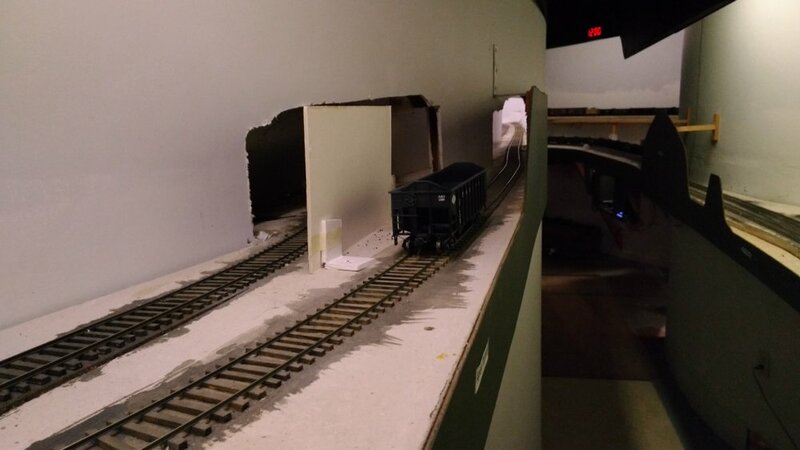 The two tracks above are C&O staged trains which arrive into Linnwood on the other side of the partition wall. They will eventually be hidden by a (removable) hillside. Stores and company houses will complete the scene. As town/structure lights are added, the LED lighting at Brooks will be dimmed as the adjacent Linnwood thunder storm wafts into this area as well.